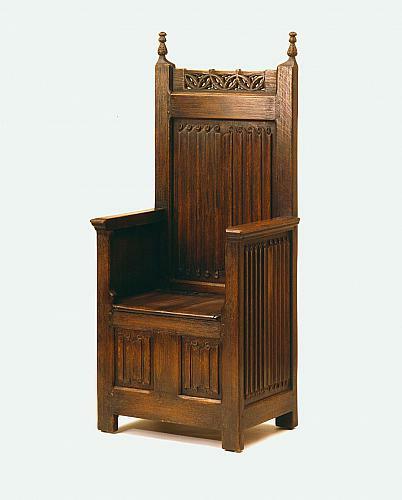 The carved oak armchair, in the Gothic style, has a pierced back rail topped by stylized finials. Note the linen fold carving on the apron, back, and side panels. The seat is hinged with an open space beneath. The seat would have had what is referred to as a squab cushion. The chair appears in a 1935 book by Century Furniture Company, which features their reproduction furniture of various styles and periods. The chair is described as a 15th century Seigneurial chair; it is depicted with a velvet cushion. This type is chair is sometimes referred to as an Ecclesiastical chair. Measurements: 62 ½ in. high (including finials), 25 ½ in. wide, 17 in. deep. The chair was purchased by the Grand Rapids Public Museum from the Furniture Museum.